If you think Christmas caroling is a lost art, think again. Caroling in Loudoun is going strong. It’s a holiday mainstay in some communities, while, in others, music lovers are building new old-fashioned traditions. In Lincoln, the annual caroling event organized by the Lincoln Community League is a beloved—and much anticipated—annual affair. Every year, carolers meet at the Goose Creek Meeting House on the south end of the village and walk up one side of the street and down the other knocking on doors and treating neighbors to holiday classics, led by musician and Lincoln Elementary School parent Andrew McKnight. And while the tradition has continued essentially unchanged over the years, carolers have had to make a few tweaks to the routine. As in many of western Loudoun’s historic villages, there are no sidewalks on Lincoln’s main drag. And with increased evening traffic on Lincoln Road, organizers have added spotter cars in front of and behind the group to help keep carolers safe and alert passing drivers. Wegmeyer said village residents often anticipate the evening as much as carolers and many have treats waiting when the doorbell rings. The evening ends with a bonfire, hot chocolate, cookies and, yes, more singing at the meeting house. Carolers close out the event by joining hands in a circle and singing “Silent Night,” creating a reflective moment after a high energy evening of sugar and merriment. This year’s community caroling in Lincoln takes place Wednesday, Dec. 20, at 6 p.m. 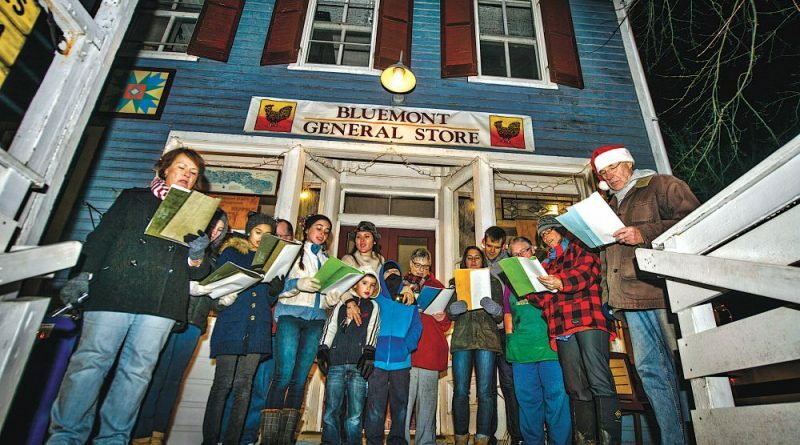 In Bluemont, yoga instructor and longtime resident Jen Stone is continuing the community’s 14-year caroling tradition for the first time without her longtime co-organizer Susan Falknor. Falknor, a local writer, archivist and historian, died in April. Falknor was the de facto choral director and keeper of the group’s beloved songbooks, Stone said, and another longtime resident and frequent collaborator, Mark Zalewski, recently moved away from the village. But with help from the Bluemont Community Center, Stone has regrouped and reprinted songbooks to keep the cherished event going. The event often starts with a small group and snowballs as the carolers move through the village, Stone said. As in Lincoln, carolers are often invited into neighbors’ homes for warm drinks and treats and get an especially warm response from seniors. “They don’t necessarily walk with us, but they stand at the door and sing with us,” Stone said. This year’s event takes place Sunday, Dec. 17, at 5 p.m. at the Bluemont General Store. In Lovettsville, teacher and photographer Joanna Wright decided two years ago that her already festive community needed a little more holiday joy. “I wanted to start this tradition with my own children so they could grow up and say they used to go caroling during the holidays with family and friends,” Wright said. She started a community caroling event in 2015 with around 15 carolers, and it doubled in size last year. Wright is expecting more neighbors this year, as folks who live on rural roads and in spread-out neighborhoods outside of town jump in. “I love the holidays and wanted to go caroling in my neighborhood. Because we don’t live in town, I figured there would be interest to have a group gather and carol at the houses in town limits because they are closer together and easier to access,” Wright said. And, as with many 21st century traditions, social media is a useful tool—especially in rural communities where residents might not see neighbors regularly. Wright tested the waters on a local parents’ page and then started a separate group for the event. It’s a great way to get the ball rolling for music lovers who want to get events going in their communities. “If you belong to community Facebook pages, gauge interest in your community first, then start a Facebook group and ask people to join,” Wright advised. Lovettsville’s caroling takes place Wednesday, Dec. 20, at 7 p.m. in the Lovettsville Town Center neighborhood. Carolers will finish the evening with treats at Lovettsville Library. Meanwhile in Leesburg, a small neighborhood event is catching on and inspiring other groups to get on the caroling bandwagon. Music teacher Teresa Smith, who owns the Little Tots Music Together family music centers in Leesburg, Purcellville and Ashburn, started caroling on her block in the town’s Country Club neighborhood. Smith, a former public school music teacher, started the event as a chance for her own children, now 6 and 3, and her young students, to sing together. She often hosts up to 40 people, including students, parents and siblings. And word is starting to spread beyond her neighborhood as local community groups look to get involved. And like so many caroling events, it’s now becoming a neighborhood institution. No caroling in your neighborhood? No worries! A few local groups have more structured caroling events coming up this weekend. Local theater troupe The Pickwick Players hosts its annual carol-fest Saturday, Dec. 16 at the Oatlands Historic House and Gardens Carriage House. Classic carols will be accompanied by delicious chocolate treats. Doors open at 4 p.m. and the concert begins at 5 p.m. Tickets are $10 for adults and $5 for children 12 and under. Oatlands is located at 20850 Oatlands Plantation Lane, Leesburg. For more information, go to oatlands.org.